Canelo vs. GGG II: WBC...Change of Heart? For the past few weeks the highly prestige World Boxing Council has been trying to strongly persuade Gennady Golovkin in taking the rematch with Canelo Alvarez. What’s even more shocking is that the WBC took indirect shots at their middleweight champion when GGG didn’t take the ridiculous and insulting offer that was made by Canelo and Golden Boy Promotions. This is right after Golovkin has turned down the 65-35 split that is in Canelo’s favor. GGG is the unified middleweight champion. He should get the lion’s share, but that is another topic for another day. This is just a few public quotes and statements made by the Mauricio Suliaman. From the outside looking in it appears that they have a favorite in this fight and it’s not GGG. This is funny, but two years ago Canelo Alvarez and World Boxing Council had a huge falling out in May of 2016 after he successfully defended his WBC middleweight championship against Amir Khan via 6th round knockout. Golovkin was the number one mandatory and Canelo had a month to start negotiating with him to set up a bout with him in September of that year. Canelo pitched a fit stating that he will not be rushed or dictated to on when he is going to fight Golovkin. 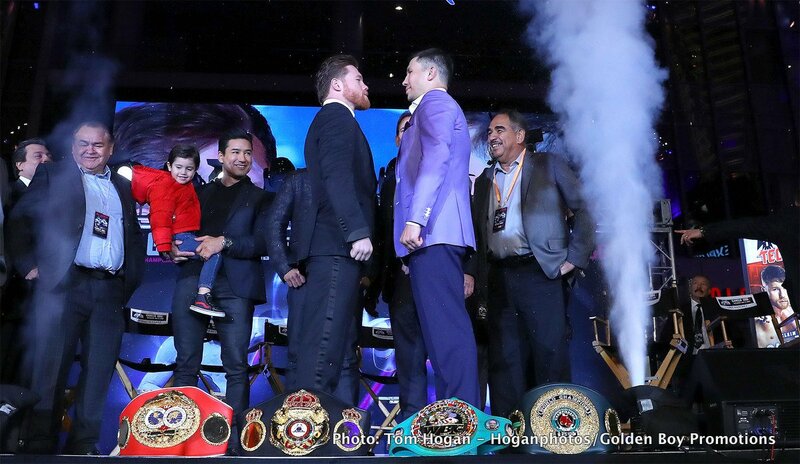 In addition, Golden Boy CEO Oscar De La Hoya chimed in and gave an excuse, stating that, “Canelo hasn’t grown into a middleweight yet, he is still 154-pounder.” Now if you look at both middleweight title fights with Miguel Cotto and Amir Khan the catch weight limit was 155. The day of the fight with Miguel Cotto, Canelo weighed-in “unofficially” 174 pounds. With Amir Khan, Canelo refused to do the same day weigh in, but according to Amir Khan he stated that Canelo weighed in 187 pounds the night of the fight. Even though I may question the accuracy of Khan statement, Canelo still came in at least 2 weight classes above the middleweight limit. So the statement of saying he is still 154 pounder was ludicrous. While that was going on, the WBC made Gennady Golovkin their middleweight champion. From May 2016 to February 2018 the WBC has been supporting GGG publicly stating that he is a great champion and we are happy to have him represent the WBC. Now fast forward to the present, the rematch has apparently has fallen through between the two combatant. It’s now appears evident that WBC have changed their position with Golovkin and is trying to get back in good graces with Canelo Alvarez, even after the bitter fall out. They are blaming GGG for the rematch if it doesn’t happen. Mauricio Sulaiman stated that Golovkin will have to face Jermall Charlo if there is no Canelo rematch. Knowing he has an IBF threatening to strip him of his title if he doesn’t face his mandatory in August. (Hearing with the IBF pending the request of an extension for the mandatory) Golovkin is trying to become the undisputed middleweight champion and politics is once again rearing its ugly head. Now this situation has comes across as that the WBC have changed their position with Golovkin and Canelo, but why the change of heart? Is it because Golovkin is getting up there in age and he might be closer to the end of his career as a significant draw? Is it because they see Canelo a fellow proud Mexican who is in his prime as a “cash cow”? Or just maybe, all is forgiven? Whatever it is, if I was GGG this whole situation doesn’t sit well with me. Especially when Golovkin has been proud loyal champion of the WBC. You are here: Home / Boxing News / Canelo vs. GGG II: WBC…Change of Heart?